They Say Nothing Outperforms Mobil 1? WRONG!!! AMSOIL INC. set out to examine the specifics of the overly broad “Nothing Outperforms...” Mobil claim. 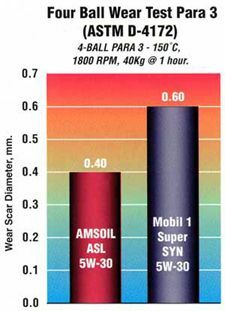 AMSOIL 5W-30 Synthetic Motor Oil (ASL) and Mobil 1 SuperSyn 5W-30 Motor Oil were analyzed in five key bench tests measuring motor oil performance: NOACK volatility, flash/fire point, pour point, four ball wear and total base number (TBN). 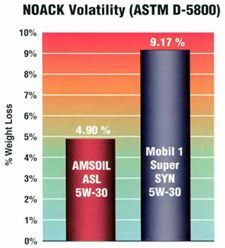 As shown in the charts below, AMSOIL outperformed Mobil 1 in all five areas. 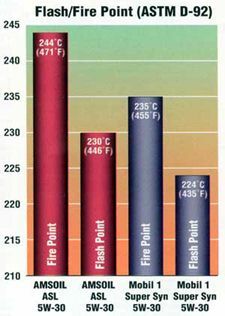 The Pour Point Test determines the lowest temperature at which a lubricant flows. The lower a lubricant’s pour point, the better protection it provides in low-temperature service. 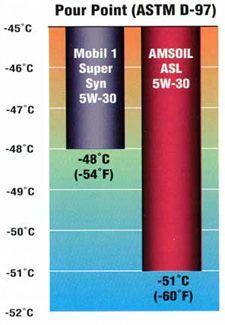 As shown in the graph, AMSOIL 5W-30 Synthetic Motor Oil has a lower pour point than Mobil 1 SuperSyn 5W-30 Motor Oil. Total Base Number (TBN) is the measurement of a lubricant’s reserve alkalinity. The higher a motor oil’s TBN, the more effective it is in handling contaminants and reducing the corrosive effects of acids for an extended period of time. 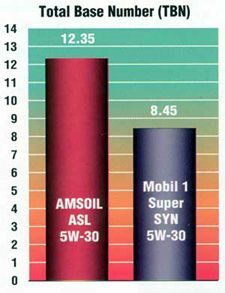 As shown in the graph, AMSOIL 5W-30 Synthetic Motor Oil has a higher TBN than Mobil 1 SuperSyn 5W-30 Motor Oil.